Those recycling their aluminum cans and batteries have the opportunity to help a local family in the process. 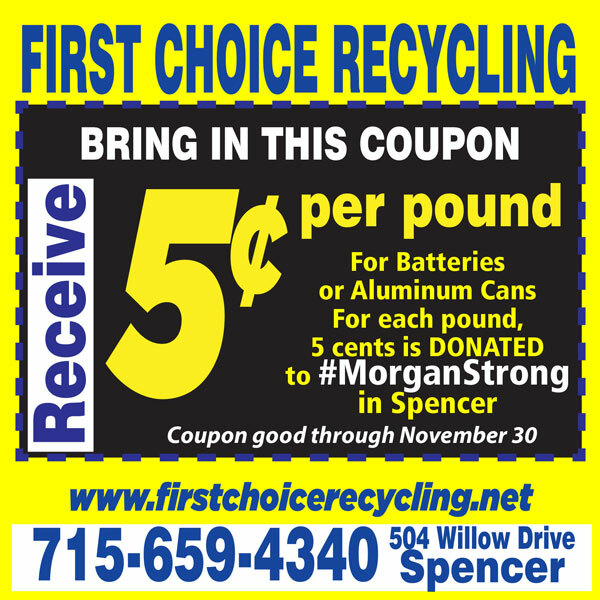 1st Choice Recycling in Spencer will be donating 5 cents per pound collected toward the #MorganStrong fundraising campaign for Morgan Gorst, a 7th grader at Spencer Middle School who was diagnosed with Glioblastoma in September. Simply present the coupon below to activate the offer. The promotion begins immediately and runs through November just before a major fundraising event for Morgan on December 1. There will be basket raffles, auction, surprise raffles, 50/50 raffle, music, snacks, and a bake sale beginning 3 p.m. For more details, visit the MorganStrong Facebook page or click here. Owner Larry Lang wanted to help out the family in memory of his brother, who passed away from aggressive lung cancer at 19. While he does not know the family personally, he had the opportunity to meet them at a fundraiser for Morgan and decided to do his own part in assisting with their medical expenses. There is no limit on the number of pounds of batteries or aluminum cans, which are best brought pre-crushed in a plastic bag without any other materials, like tin cans. Cans can be dropped off at 1st Choice Recycling anytime during business hours between 8-5 p.m. Monday through Friday, or 8 a.m. – Noon on Saturday. 1st Choice Recycling is located at 504 E. Willow Drive. For information or details give First Choice Recycling at call at 715-659-4340 during hours of operation.